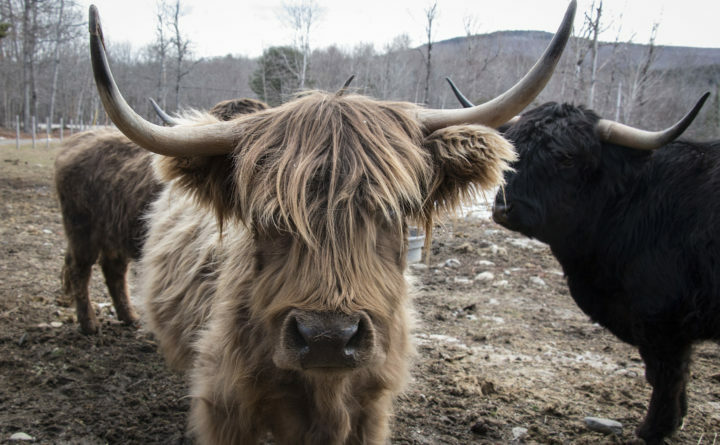 Scottish highland cattle wander the pasture in Orland. When it comes to supporting the state’s farmers by buying locally raised meat or poultry, meat labeled “Maine Raised” might seem to consumers to indicate the animals were born, raised and slaughtered in Maine. But that may not be the case. Presently it’s legal for businesses to import animals from out of state, kill them here and sell them as “Maine Raised” meat. A proposal before the legislature is aiming to change that. LD 351: An Act to Ensure Accuracy in the labeling of Maine Meat and Poultry would require livestock such as beef, pork or lamb be born and raised solely in the state and poultry be raised in the state from no later than seven days after hatching before it could be labeled and advertised as Maine raised. The bill is sponsored by Rep. William Pluecker, D-Warren, who runs Hatchet Cove Farm in Warren with his wife Reba Richardson. Aaron Bell of Tide Mill Organic Farm in Edmunds in testifying in favor of the bill last month said false labeling violates the trust of the consumers who support local farmers. It’s basic common sense legislation, according to Andy Smith, owner of the Milk House Farm in South Monmouth, who also testified in favor of LD351. Costs to raise meat in those states are often less than the costs faced by Maine farmers, Smith said. The bill does include protections for Maine’s meat processors, Pluecker said. At the same time, Pluecker is committed to protecting the “Maine Raised” brand. The legislation is currently with the legislature’s agriculture, conservation and forestry committee where members are fine tuning the language before voting to send it on to the Maine House and Senate. Pluecker is confident his bill, that was overwhelmingly supported during last month’s testimony, will make its way out of committee for a vote in the Maine House and Senate, once a few more details are ironed out around enforcement.